“IT isn’t our fault, our people don’t read books, how can we make money?” asked library director M’bet Ambushu. When the library first opened, locals poured in. But it soon became clear they were only there to steal the valuable books. 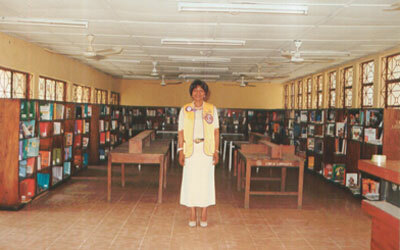 After a month, the shelves were barren of the top choices and people who came to the library began to dwindle. The headquarters of the National Library of Nigeria in Abuja has been given an eviction notice for owing N508m in rent of the building it temporarily occupies in the Central Business District. The National Librarian, Professor L. O Aina, made this known on Monday while speaking to the Senate Committee on Basic and Secondary Education. He said that one of the major challenges of the agency was nonpayment of three months’ rent for the temporary headquarters building in Abuja. According to him, “the non completion of the of the headquarters building in Abuja, the contract for which was awarded in 2006 at the cost of N8, 590, 226,393.00 made operational coordination and service delivery difficult. In his remark, the chairman of the committee, Sen. Aliyu M. Wamakko said the oversight visit was to enable the committee monitor how the 2016 budget was implemented and also assess the challenges facing the agency and chart way forward.